Photo courtesy of Laura LeSire. Found on the back of a Valentine’s Day card. Billy! Sue! Stop playing doctor this instant! I got some candy in my pocket little girl. Is that snickers bar in your pocket, or are you just happy to see me? Dammit! Follow the damn laws of physics! You can’t BOTH be in the others pocket! I remember waking up with honey & cream in my pockets one morning… I wasn’t at a picnic. You show me your picnic and I’ll show you mine. Woah what happened last night? …Hey! What are you doing in my pocket! You were in mine first! But honey, I swear I thought it was your pocket. I’m sure you are, dear. I play pocket picinic all the time, want some summer sausage!? There’s a party in my pants, a picnic in my pocket. 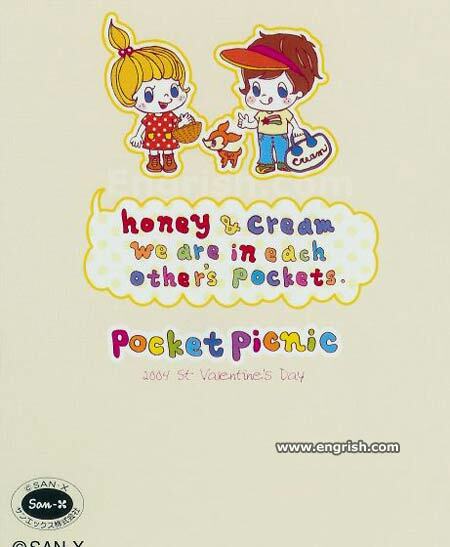 What better day to have a pocket picnic than Valentine’s Day? Is that Cream in your pocket? So YOU ARE happy to see me!!!! so THATS why mom ripped off all my pockets ! Is that a picnic in your pocket, or are you just happy to see me? If you shove your honey-smeared hand in my pocket, im gonna shove my cream-dripping hand in yours!